Wet stamp verso print in purple ink: "moholy-nagy/berlin -chbg. 9/fredericiastr. 27 atelier". Titled verso print in purple ink. 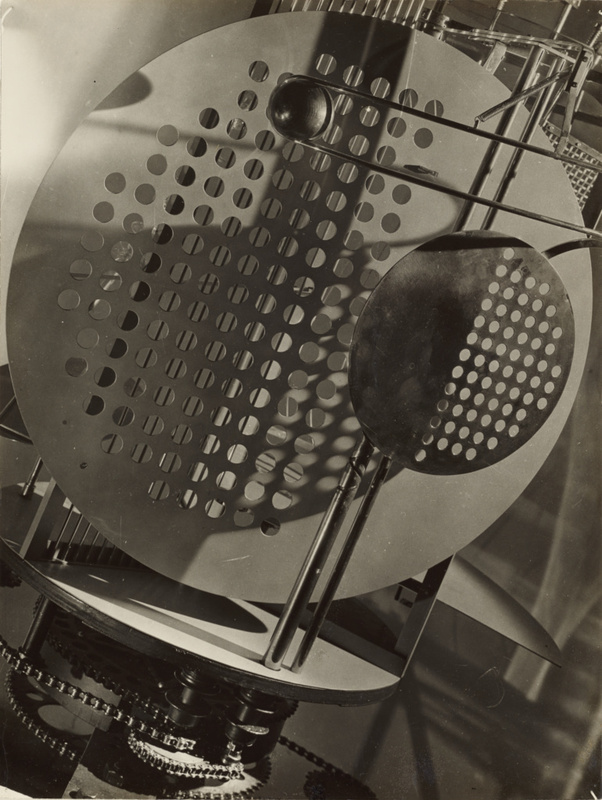 Also called Light Prop for an Electric Stage, this kinetic sculpture that László Moholy-Nagy designed and photographed was intended to create light displays for theater, dance, or other performance spaces. With its gleaming glass and metal surfaces of mobile perforated disks, a rotating glass spiral, and a sliding ball, the Light-Space Modulatorcreated the effect of photograms in motion. As photographed here, the geometric complexity of the design and the shapes created by shadows and light convey the dynamic possibilities of both machine and camera. Ware, Katherine.In Focus: Laszlo Moholy-Nagy. Photographs from the J. Paul Getty Museum (Los Angeles: The J. Paul Getty Museum, 1995), p. 80-81, plate 42, ill.